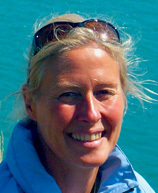 Vasanti Niemz, born 1956, is an amateur ultra-distance lover. 2x EC (1985+2010, 2010 ultr-tri Dover Aachen), 9x Zurich Lake Marathon Swim, 6-day race, 2x triple-ironman Lensahn etc. She studied in Heidelberg, where she works self-employed in PR and internet marketing, practicing yoga, endurance sports and meditation and teaching kids yoga at schools on the side. She has been a vegetarian since 1981 and loves to share a sustainable plant-based lifestyle to protect our planet. This blog – the continuation of http://www.channel-triathlon.blogspot.com/ – chronicles Vasanti’s journey to a long-cherished dream: an ultra-triathlon involving swimming the English Channel (without wetsuit), then biking from Calais via Brussels and Bonn along the Rhine to Bingen close to Mainz (about 560 km), and running the remaining 85 km to Heidelberg, with only a few hours of rest in between. After my first solo EC swim in 1985, 2 EC relays (1989 and 2009) and a failed attempt in 2008 (hypothermia after 13 hours) 2010 saw the the “short” version of the Channel-triathlon Dover-Aachen in Sept. 2010. This dream is a personal challenge, inspired by and dedicated to the vision of the World Harmony Run, now renamed Peace Run again, and its founder, Sri Chinmoy (1931-2007), who was known as a “Dreamer of Peace” and extreme athlete in his own right, and his love of “self-transcendence” challenges – as opposed to trying to competing with and defeat others. On top, I am happy to demonstrate that a healthy vegetarian diet (I have been a vegetarian since 1981!) is by all means compatible with intense athletic activities, even Channel swimming, since a change in our diet on a global scale would be a valuable contribution to a more sustainable world living in peace and harmony. The details about my attempt in 2008 including a number of interesting and informative links, can be found on my old blog: www.channel-triathlon.blogspot.com. In September 2010, I was grateful to complete a shorter version Dover-Aachen – but the bigger project is still to come. After my hypothermia-experience after 13 hours 40 min. in September 2008, I was sure I was going to try again in 2009 – but it was not possible to keep up the training intensity and afford the time and money needed for the project. I wanted to at least do the Zurich lake (27 km) as a longer training swim in 2009 but registered too late. A last minute slot would have been available, had I gone to Zurich to help, because one swimmer did not turn up. But severe tendonitis of my right wrist in July had prevented me from training more seriously and would not even have allowed me to row. Then, at the end of August, a big surprise: I got a last minute invitation to be part of an international Sri Chinmoy Marathon Team relay across the English Channel at the end of September. One of the 3 original swimmers from the of Czech Republic had dropped out, and Viktoria from Iceland would be a strong forth swimmer. Stepping up my training a little and going to Dover early for some acclimatisation and sea water training, I was just about prepared for 4 to 5 hours in the Channel with some rest in between. On Sept. 30th our team of 4, skillfully guided by our pilot Eddie on Anastasia, made it across, in very favourable if not magical conditions (including swimming under a huge moon! ), in what for us was an amazing time of 13 hours 21 minutes (1 min. slower than our 6 person relay in 1989!). 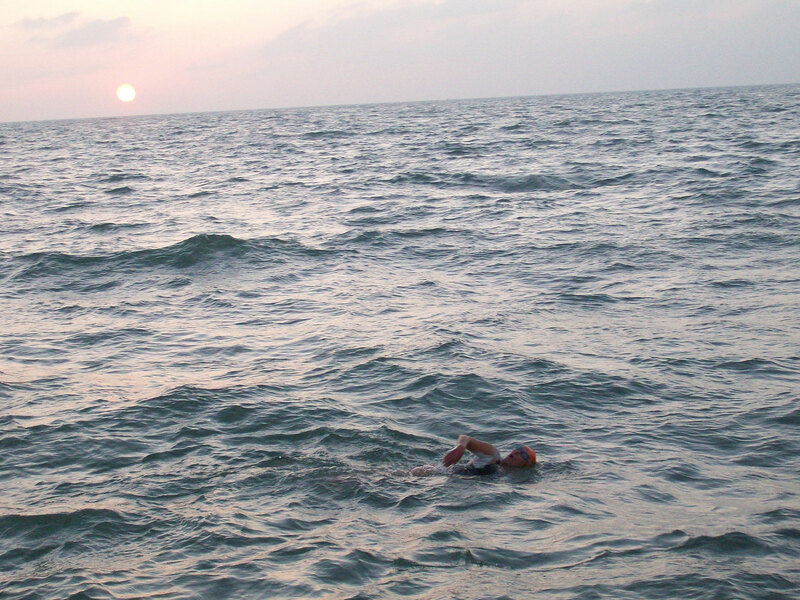 I was the lucky one to swim ashore and touch French sands at Wissant – just like back in 1985 with my solo swim. At the same time it was the 20th anniversary year of our team’s Channel relay of 1989 – another special experience along the way! With lots of luck (or Grace) and inspite of booking late, Eddie Spelling, our relay pilot in 2009, was able to offer me a first position slot for the tide of Aug. 30 to Sept. 6, 2010 due to cancellations – I couldn`t believe it! And we will be staying at Varne Ridge again. Now serious training is starting again – and hard work to be able to pay for this adventure! And helpers are needed again! Sept. 3rd-6th, 2010 – We made it! Thanks to everyone involved as helper, supporter, inspirer…! Left: the shorter route for 2010 (only Dover – Aachen, the original distance of 1985 which Vedika did to Paris). The long version is still to come. March: 6 hour race Nürnberg – did it. Another long time dream come true – my first multi-day race! 342,7 km / 213 miles – a humble result, but a personal best and I was very happy and grateful. August: Zurich Lake (Rapperswil-Zürich) – did not participate due to pulled muscle. Manhattan Island Swim, Catalina Channel, Gibraltar Straits? Arch 2 Arc Enduroman London-Paris?